The Cadogan Hall is firmly in Christmas mode with decorations, a huge tree and mulled wine, and the latest Choral at Cadogan concert joined in the fun on Monday 12 December 2016 as Andrew Nethsingha and the choir of St John's College, Cambridge gave us a programme of Christmas music. But this wasn't a straightforward romp through Christmas classics, Andrew Nethsingha had put together a programme which mixed the well known with the lesser known, including two solos from assistant organist Joseph Wicks and organ scholar Glen Dempsey. So the programme moved from Jonathan Harvey and Robert Parsons, through Carl Rütti, Elizabeth Poston and RVW to Ivor Atkins version of Peter Cornelius's The Three Kings and a couple of carols. We also moved from the Annunciation through the Virgin Birth, to the Shepherds and finally the Three Kings. Whilst the concert's programme had a lot in common with St John's recent disc Christmas with St John's, it has to be born in mind that the disc was recorded almost a year ago, and the choir has changed since then. 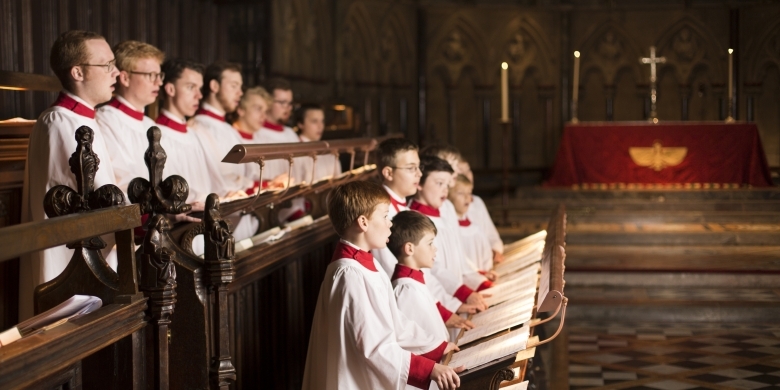 There has been another academic year, another intake of young men, a moving on of treble whose voices break and a welcoming of new junior trebles. A choir like that of St John's is always in a state of flux, so the striking thing is how consistently the ensemble remains true to its aims. We opened with Jonathan Harvey's 2011 piece, The Annunciation written for the choir and one of the composer's last pieces. I heard the group singing the piece live in May in St John's College Chapel this year at the launch of the new St John's label (with a disc devoted to the music of Jonathan Harvey, see my review). Heard in the drier acoustic of the Cadogan Hall, it was possible to hear more detail, and marvel at the way Harvey had constructed a piece which respected the limits of writing for a collegiate choir of men and boys (Harvey was himself once a chorister), yet created some lovely complex turns of harmony and evoked a sense of the numinous. Robert Parsons' Ave Maria started with a slightly over robust incipit, but then recovered a fine sense of poise as Andrew Nethsingha made the music grow organically. Jonathan Harvey's The Angels dates from 1994 and again combined a feel for the choral texture with lovely harmonies (well placed by the young singers) into something magical. Lacking an organ, Glen Dempsey (the current organ scholar at St John's) gave us Bach's Prelude and Fugue in A flat major, BWV 862 from Book One of the Well-Tempered Clavier crisply vigorous prelude followed by a flowing fugue with great cumulative power. Elizabeth Poston's simple yet effective Jesus Christ the Apple Tree enabled us to appreciate the good strong sound the trebles made. Carl Rütti's I wonder as I wander (with accompaniment from Joseph Wicks) had an appealing hint of jazz to it. Bob Chilcott's The Shepherds' Carolwas very effective and beautifully performed. Anthony Milner's Out of your sleep (again with Joseph Wicks) also had popular hints in the music, whilst John Rutter's Dormi Jesu (with Joseph Wicks) had some fascinating jazz-inspired harmonies at the end. The first half finished with a wonderfully engaging performance of John Gardner's ever popular Tomorrow Shall Be My Dancing Day. The second half opened with an extra item, Andrew Nethsingha announced that when the choir arrived at the Cadogan Hall that afternoon he added RVW's short anthem O Taste and See, with the solo sung very creditably by William Buttery (one of the two newest trebles, one of the youngest and the first time he sang the solo). This was followed by RVW's 1948 John Skelton setting Prayer to the Father of Heaven with the choir bringing a lovely clarity to the familiar RVW harmonies, and rising to great power at the climax. The second instrumental contribution was Glen Dempsey and Joseph Wicks performing the first movement of Mozart's Sonata in C for four hands K521, full of crisp playing and not a little charm too. Simon Preston's arrangement of I Saw Three Ships (with piano from Glen Dempsey) was full of imaginative variations of scoring, with a lively treble solo. John Joubert's There is no rose was rather lovely, whilst William Mathias's Sir Christemas(with piano from Glen Dempsey) was full of lovely rhythmic vigour. Ivor Atkins arrangement of Peter Cornelius, The Three Kings was given a magical performance with a lovely baritone solo. We then finished with a pair of traditional carols (thankfully no audience involvement), The Holly and the Ivyand Ding Dong Merrily in High, this latter in a lived arrangement by Mack Wilberg for choir and piano duet. We were treated to an encore, when Andrew Nethsingha took a back seat and the men of the choir performed a lively, close-harmony rendition of Jingle Bells!.